On-site service – breakdowns and emergency repairs. Spare Parts - for all makes of presses. Power Press Inspections – compliance with HSE regulations. CAD Design and ‘Reverse Engineering’ – components and assemblies supplied without access to original design documentation. Machine Refurbishment and Upgrades – re-machining press components, and replacing worn out or obsolete lubrication, pneumatic or hydraulic systems. Clutch & Brake Conversions - installation design, press modifications and fitting of Combined Clutch & Brake Units. Hydraulic Presses - new bushes and seals; press rams re-machined and ground. Machine Relocation - a complete ‘turnkey’ service for relocating existing presses and equipment or the installation of new machinery. Electrical & Control Systems – breakdown service, safety checks and repairs. Press Control System Upgrades - re-wiring, replacement control panels, PLC controls for single press or integrated production cell. Machining – ‘in house’ manufacture using a host of Lathes, Vertical and Horizontal Boring machines. Sub-contract Manufacturing - a single component or batch manufacturing. In serving industry for 35 years, Midland Power Press Services Ltd has demonstrated the ability to respond quickly and offer cost effective engineering solutions. We count blue chip customers in the automotive, aerospace, white goods, forging and food & beverage sectors within our client base. 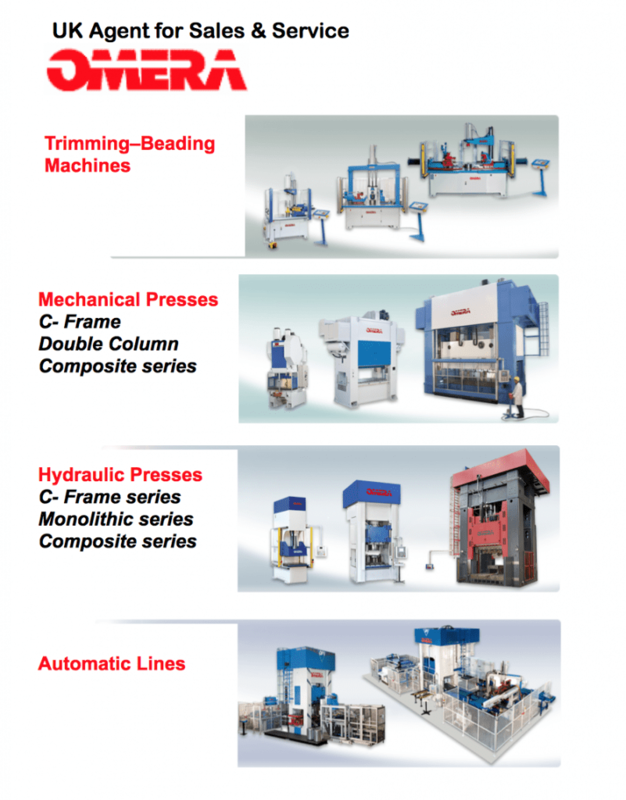 MPPS are now the UK Agency for Sales and Service of OMERA, Italy - an extensive range of metalforming machinery.